Polystyrene (PS) is a widely used, well-established plastic that can be encountered in many situations in everyday life. In this recently published study, the market research institute Ceresana analyzes and examines the development of the global market for polystyrene. Global demand is expected to increase at higher growth rates during the next couple of years than in the past. Growth rates, however, will be lower than that expected for the economy as a whole. Development of the worldwide polystyrene market will nonetheless continue to be closely linked to the future development of the global economy. The most important determinants of demand development are: Population growth, urbanization, a change in household structures, and an increasing middle class, in combination with rising private consumption, in emerging countries in particular. The global economy will continue to recover during the next few years and thus provide the general framework for a moderate increase of polystyrene consumption. Yet demand for polystyrene will not rise as dynamically as demand for other standard plastics due to a change in technologies and advancing substitution processes. Market researchers at Ceresana forecast global demand for polystyrene to rise by, on average, 2.3% per year. This worldwide most comprehensive report is exclusively available at Ceresana and offers complete transparency in regard to the current situation and future development for the first time. That this market is worth a detailed analysis becomes obvious simply by the fact that revenues generated with polystyrene are likely to rise to approx. US$26 billion in 2020. For the first time, all market participants are able to get a complete overview over all relevant data and facts as well as background information regarding the Polystyrene (PS) market, market trends, market size and market growth. Almost every second tonne of polystyrene is processed in Asia-Pacific. Thus, this region is the most important sales market, followed by the industrialized regions North America and Western Europe. Ceresana forecasts the focus of polystyrene demand to continue to shift towards Asia-Pacific, at the expense of saturated industrialized markets in North America and Western Europe. Emerging countries, on the other hand, are profiting from a continuous increase of wealth and a moderate population growth. Even though Asia-Pacific is expected to expand its position as worldwide largest consumer, Africa, the Middle East, Eastern Europe, and South America are also projected to develop at dynamic growth rates. In the past, capacity utilization of polystyrene plants averaged at only about 75%. This resulted in an, in part, considerable reduction of capacities and restructuring undertaken by manufacturers. Industrialized countries in Western Europe and North America as well as Japan and South Korea have responded to the excess capacities by reducing production volume and refocusing on growth markets. By now, manufacturers are more focused on quality than on quantity. Important characteristics of polystyrene, e.g. surface gloss, impact resistance, resistance to stress cracking or flow properties are to be optimized, thus allowing for an increased range of application. In order to satisfy the rising global demand, however, production capacity has to increase again. Global capacity is scheduled to be expanded by 700,000 tonnes until 2020. More than 90% of these new capacities will be created in Asia-Pacific. The Packaging industry in particular consumes a large amount of polystyrene, in the subsegment food packaging in particular. Additionally, polystyrene is often used in the casings of monitors, televisions, printers, and other electrical devices as well as consumer goods. Individual application areas for polystyrene are projected to develop at highly similar growth rates during the upcoming eight years. Ceresana forecasts the highest growth rates for the segment Electrical & Electronics; market volume is projected to increase by, on average, 2.8% per year. Development in the Packaging sector will be only slightly less dynamic. As a consequence, E&E applications will account for approx. one third of global demand for polystyrene in 2020. 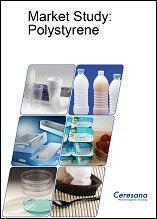 Chapter 1 is a description and analysis of the global market for polystyrene (PS). Demand, revenues, and production are explained in detail. Additionally, data on existing and future production capacity is provided. This report offers a comprehensive overview over development expected for individual countries and regions as well as global market dynamics. Chapter 2 examines the 20 largest countries of the market in more detail and provides information on demand, revenues, production, import, and export of polystyrene as well as current and future capacities. The analysis of demand for polystyrene is examined in detail split by the applications Packaging, Electrical & Electronics, and Other Applications. Chapter 3 offers an in-depth analysis of various applications of polystyrene, such as food packaging: Data on demand development is split by Western Europe, Eastern Europe, North America, South America, Asia-Pacific, the Middle East, and Africa. Also, consumption figures for specific larger countries in these regions will be given. Chapter 4 provides a useful directory of producers, clearly arranged according to contact details, turnover, profit, product range, production sites, profile summary, product-specific information as well as existing and future capacities at individual production sites. Extensive profiles of 52 manufacturers are provided, including Styrolution Group GmbH, Total SA, Styron LLC, Americas Styrenics LLC, and Formosa Plastics Group.